Parents Bus Trip Round 2! Home » 2018 » Parents Bus Trip Round 2! 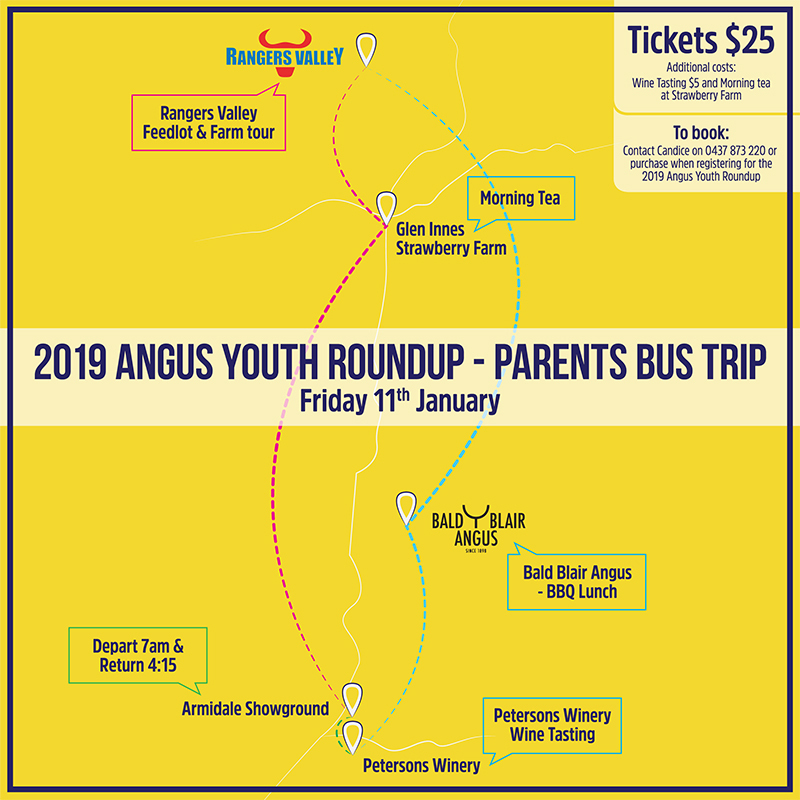 Due to popular demand, the Parent’s bus trip at the 2019 Thomas Foods International Angus Youth Roundup has added a second bus to the day trip. Since the parents can’t get enough of the bus trip, spaces are now available for those who may have missed out, however spaces are limited so get in quick before they fill up! The itinerary for the day starts with a 7am departure from the Armidale Showground with the first stop being Rangers Valley Feedlot and Farm to tour their state-of-the-art feedlot operations. Morning Tea at the Glen Innes Strawberry Farm is stop 2 with the group then heading to the historic Bald Blair Angus for a BBQ lunch. The tour will roundup at Petersons Winery Wine Tasting before a 4.15pm return to the Armidale Showground. Tickets for the parent’s bus trip are $25 with additional costs of $5 for wine tasting and morning tea at the Strawberry Farm for purchase at your own cost. For further information or if you wish to place a booking please contact Candice Liddle on (02) 67734622 or email youth@angusaustralia.com.au.